With the warm weather, patriotic holidays and aroma of backyard cookouts everywhere, it’s only natural to want to invite friends and family over for a get-together. After all, it’s the perfect time to be outside having fun. But that fun can often come with a big cost. You can have an awesome celebration by being creative and spending wisely. It just takes a little planning on your part. 1. Do a menu switch-up. Everybody goes to a summer party expecting hamburgers, hot dogs or barbecue as the main course. What if you change things up by offering sub sandwiches or finger foods? 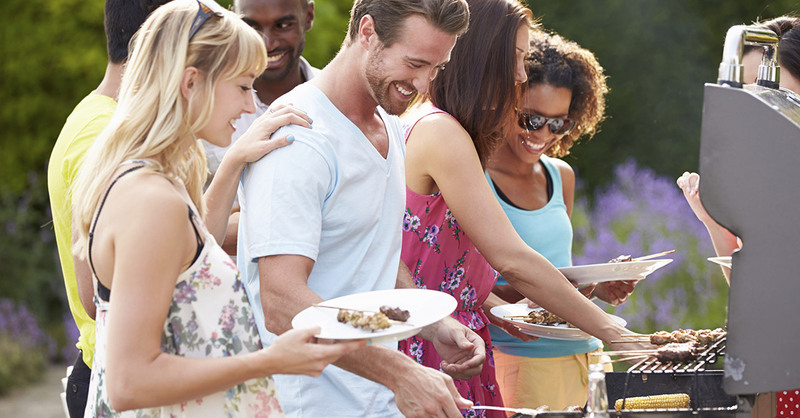 It's less expensive—and you won’t have to stand by a hot grill for most of the party! 2. Host a dessert contest. This helps cover food and entertainment. Get some of your competitive friends to bring their favorite homemade desserts so you can have a confectionary contest. Your guests can try each dessert and vote on their favorite. 3. Hold your party in the afternoon. When the gathering is in the evening, people expect dinner-sized food portions and maybe even some entertainment—both of which can cost you. Afternoon parties are lighter and usually involve things like finger foods, swimming, and water gun fights for the kids. An earlier event takes the pressure off you and your money. 4. Let a buddy do the baking. Do you have a friend who is starting a catering business or who sells desserts on the side? If so, this could be a way to have high-quality fare for a lower price. Ask your friend if they’ll handle the food or desserts at cost. Then go out of your way to sing their praises to your guests and on social media. Take pictures of the cuisine and post them online with compliments and your friend’s contact information. They’ll get some great exposure and you’ll get great food for less. That’s a win-win situation! 5. BYOM. A bring-your-own-meat party is great for giving your guests the dinner they want. Not only will they enjoy the food (since they brought it), but it saves you the cost of buying that part of the meal. Try it—you might even start a party trend in your neighborhood! 6. Head to the dollar store. Get your paper plates, plasticware, napkins and small decorations at the dollar store. If that feels cheap, just remember, people don’t make memories at your party by looking at the decorations or plates, so there’s no need to spend a bunch of money on them. 7. Buy in bulk. Buying food and supplies in bulk is a wise choice if you’re inviting a lot of people over. Before you shop at Costco or Sam’s, calculate how much you need so you don’t overspend. If you have food left over, send some home with your guests or pack it for lunch throughout the week. That could even lessen your grocery bill for the month! 8. Make it a potluck. Food for a get-together can be pretty expensive, but it’s a cost you don’t have to bear alone. Ask each of your guests to bring a dish. Not only does it help you control the cost, but also it ensures a variety of eats for everyone. 9. Beware of Pinterest. Pinterest is great for finding ideas for budget-friendly décor, but make sure your search ends there. Don’t get carried away or overspend by trying to duplicate someone else’s beach/luau/tropical paradise-themed party. If you’re primed for a party this summer, remember this: You can have the party you want with the money you want to spend. Add a summer bash to your monthly budget to see how much you want to spend. It's free and takes less than 10 minutes to set up.